Leaving tomorrow morning to head out to see my family in Ontario / Northern New York. I've got a 15 hour layover in Seattle... that should be fun. OK, maybe not, but I am going to try to get out for a run while I'm there so it might not be so bad. The extended forecast looks great for Northern New York. It will be nice to go somewhere sunny. And to not work for 10 days. 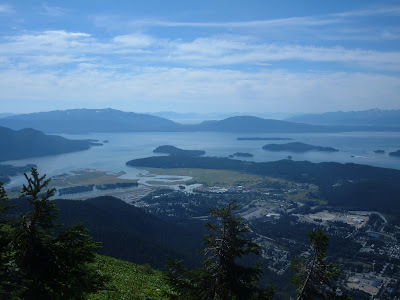 But it will also be nice to get back to Juneau and start in to my training for next year. In a weird kind of way I'm excited for the dark, cool, damp weather that is taking over Juneau for the next several months. It's actually been a couple months since I've been out running or biking in the dark but that's all going to change in a couple weeks. 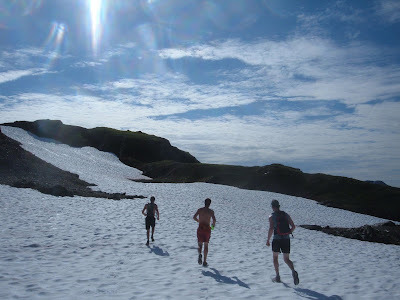 Also best luck to all of those with big races in the next two weekends: Pete B., Lynda W., Danielle M., Matt H., Wynn D., and my best friend, Bryan L. who's doing the first ultra endurance race of his life next weekend. I've had a nagging head cold for 5 days now. It's better today than yesterday but not gone yet. Thus very little running or biking for about a week now. I'm in the middle of a planned rest period for several weeks but I can't help but feel a bit of anxiety when I don't get out for a good run or ride for a few days. My original plan was to keep my training very low key until at least early to mid October but I can tell already that this just isn't going to happen. I'm taking a vacation out to New York to see my family next week and will return to Juneau on September 11th. At that point I'll likely be starting back at 6 or 7 days a week of running and/or biking and/or weight training. I find lately that I'm just not as relaxed and content with my day to day life when I'm not running and/or biking most everyday. just my luck that the one thing I've found that I'm entirely passionate about has pretty near zero opportunity to "make a living" at. Too bad I don't have the interest in medicine or law that I have in endurance racing. After an exceptionally dry first part of August the rain has returned to Juneau in full force. Not letting the weather keep me down though. Got in some fun activities this week when I wasn't working. 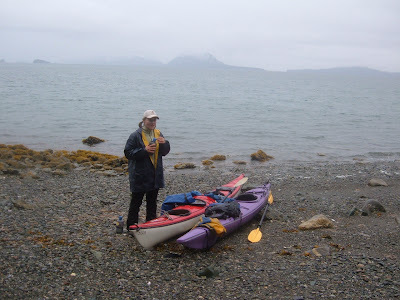 A couple nice little runs; an overnight backpacking trip to a public use cabin on Thursday; and 4 hours of sea kayaking today. Beginning to a feel a little sinus cold coming on but better now than a few weeks ago when I was racing still. My next serious race won't come until February: The 350 mile Iditarod Trail Invitational. I'm planning to begin my training for that event about 6-8 weeks from now. Currently any running or biking I'm doing is exclusively for pleasure. And yet each time I'm out running I find myself thinking about February. This race is going to be so much more demanding than anything I've done to date. Not only will it more than triple the longest race I have ever run but it will be in interior Alaska, in February, where temps are likely to drop to -20 or colder. Invariably when I think about this event my mind wanders to thoughts about the race record in the foot division. 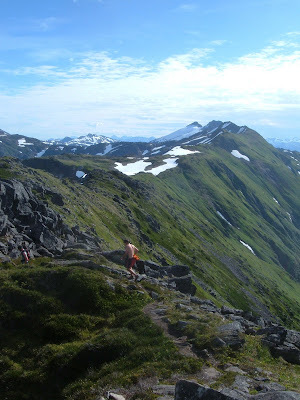 In 2005 fellow Alaskan, Steve Reifenstuhl finished this race on foot in 4 days and 15 hours! I can't get this thought out of my mind lately. This just doesn't even seem possible to me. That's an average of just over 75 miles per day, dragging behind you on a sled everything needed to survive for this time in the above described conditions (with the exception of some of your meals which can be eaten at the checkpoints along the way). 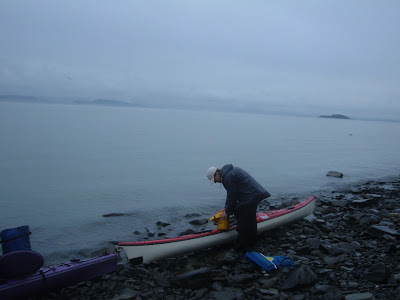 In this past winter's Susitna 100 it took me almost 22 hours to travel 100 miles in similar (but much warmer) conditions. Within 2 hours of finishing I was unable to walk for about 48 hours. The thought of going back out for another 50+ mile day the next day was absolutely 100% NOT an option. How anyone could travel 75 miles per day for almost 5 days under these conditions is beyond belief to me. I think it is very safe to say that this record is going to stand for a long time. I set out for Mt. 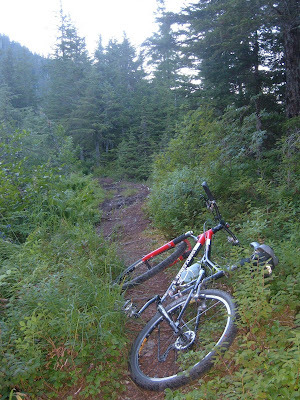 Roberts to Sheep Creek loop today but it just wasn't meant to be. The clouds were settled in really low and as soon as I got beyond Mt. Roberts I had no idea where the hell I was or where I was going. I couldn't see more than a few feet in front of me and it was windy, rainy, and cold. I only went about 1/4 mile along the ridge beyond the established trail and I still had a hard time finding my way back once I decided it was time to turn around. Guess it's time to get me one of them there GPS thingies... or at least carry a damn compass next time. Still got a nice 11 miles in with about 5,000 feet of climbing. Looking Northwest "out to sea"
Looking down the drainage I was hoping to follow down to Nugget Creek. 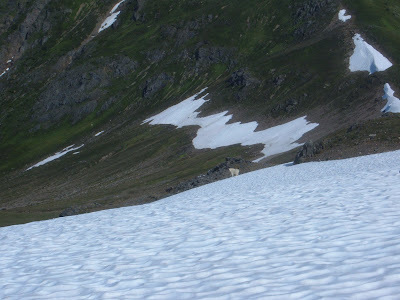 There's a bear down in the middle though so I had to change my route and drop over the ridge on the left and into some serious steep terrain with a few miles of annoying bushwhacking. 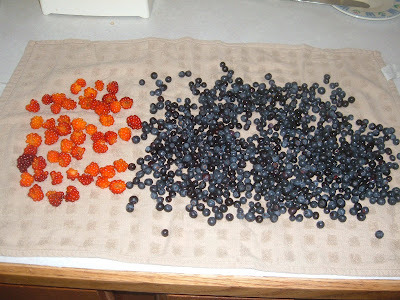 There's something about harvesting berries, especially wild berries, that's always been very satisfying for me. It doesn't seem to be a particularly great year around Juneau for berries but if you're patient and don't mind some bushwhacking there are plenty to be found. 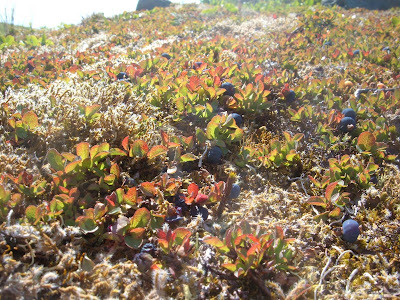 Wild blueberries are damn small though, and you can pick for a couple hours just to get enough for a small pie. But somehow it always feels worth it. Over the years I've had many "dream careers". A couple years ago I wanted more than anything to be a berry farmer. 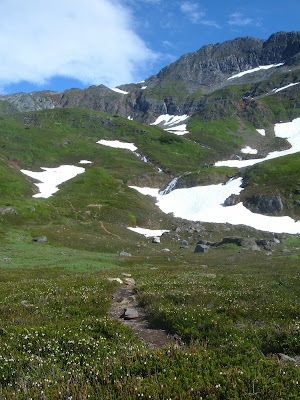 Find some cheap land in a remote part of Alaska, plant my bushes, wait for the berries to come, and then hopefully for people to give me money for my berries. Ahhh, if it were only that simple. I guess I probably had a better shot at making it as a berry farmer than I have of making it at my current "dream career" of endurance racing. It has been over 70 for 4 days in a row now and the forecast is for more of the same for 2 more days. This is by far the sunniest and warmest stretch of weather we have had since moving to Juneau a year ago. Last August there was measurable precipitation 30 of the 31 days. So far this August there has been precipitation on only 5 of 13 days, and 3 of these days were .02" or less. Our total precip. for the month so far is .52" and the month is almost half over. The average for August is over 7". I'm not complaining. It's times like this that I really feel Juneau starting to grow on me. I was overheating pretty good while out for a short (7 mile) run today and I couldn't help but think of how unbearable it would be to be running in the temperatures that occur throughout most of the country this time of year. To all of those in the lower 48 I feel for you. I realize that the 75 degrees that I was "overheating" in today would be a serious cold snap for most people reading this blog. 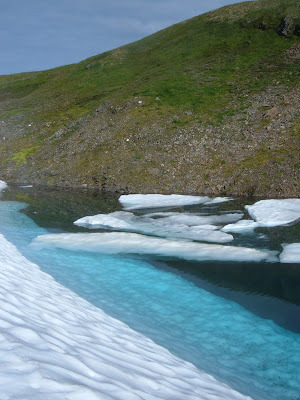 There's a great story recently posted on the Mountain Bike Forum by Mike Curiak about heat waves, Alaskan winters, and biking one of the toughest races in the world. Read it here. It's worth your time, especially if it keeps you from being out in the heat. Got out for a nice hike/climb up Mt. Jumbo with Jill this morning. 3,400 feet of climbing in 2.6 miles. Nice mellow morning walk and then spent the rest of the day shopping for bike parts on the internet and resting my tired legs. Got out for a nice 19 mile run with some friend's this morning. Getting up at 6 am wasn't too much fun after being out on the beach with friends and a little too much rum until almost midnight, but once I was out running I was glad to be out early while it's still so calm and quiet around town. We quickly left town though and headed up the trail toward Mt. Juneau. After hitting the summit in 90 minutes we traversed the ridge for several miles in some of the most ideal weather we've had in the year I've lived in Juneau. Bright blue skies and temperatures in the low 70's! Tomorrow it's supposed to be in the upper 70's. 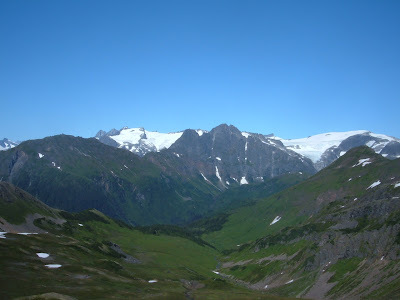 Eventually we dropped down into Granite Creek Basin which brought us back to The Perseverance Trail and back to where we had started over 4 hours earlier. It was a great run but I didn't feel that great. My legs are really quite tired out from 75 miles of racing in the past 3 weeks. I took it easy all week this week (just some short bike rides to work and back) but I'm on my feet all day at work and because of this my legs just haven't been able to fully recover yet. I'm hoping to have a really mellow recovery day tomorrow in which I spend as much time as possible off my feet, but it's going to be so hard to resist getting out in the nice weather... maybe just a mellow berry picking hike will be in order. There was a short write up about my race in today's Anchorage paper. Read it here. It's been an amazing racing season for me. I still have a ways to go but I feel like I'm twice the endurance racer/mountain runner as I were at the start of the year. I had 4 races that I focused on this season and I won all 4 of them, setting 3 new course records! I've looked through several results of 50 mile races so far in 2007. As far as I've been able to tell my 6:09:19 this past weekend is currently in the top few of 50 mile trail times so far this year. I found 2 that were definitely faster and I'm sure there are more that I'm not coming across, but at any rate these last couple races far exceeded any expectations I had in mind. I am of course very excited about this and anxious for next season already. I will be very happy to branch out into some lower 48 races next year. 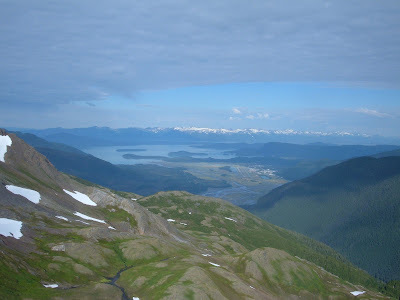 There are some amazing endurance/mountain athletes and events in Alaska, but I'm excited for next year when I'll get to test my abilities against larger and more diverse fields of runners and bikers. Enough about that though. Mostly I wanted to say thanks to friends, family, and fellow Internet geeks for all the tips and words of support throughout this year. As much as I prefer to do most of my training alone it's still really nice to know that I'm not entirely on my own as I'm trying my best to stumble (or maybe leap is a more apt term) forward in a hobby that now has me so completely consumed that I couldn't get out if I tried. As this has become exclusively a journal of my training and racing I'll likely only post on occasion for the next several weeks (although I still haven't decided for sure on that Equinox Marathon next month) as I take a nice break from all of this. Sometime in October or November though I'll begin getting back into it pretty seriously in preparation for a season next year that I hope will make my accomplishments this past season seem trivial. And by the way, I'm recovering great from this past race. I rode my bike to work today and have almost no muscle soreness. I'll probably even get out for a nice berry picking hike/run tomorrow or Wednesday. Maybe I'll even remember to take my camera and click some pics. Off to Anchorage tomorrow afternoon. Should be a fun weekend. 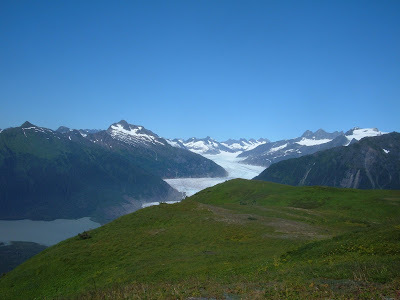 I like these short trips out of Juneau. As much as I'm getting more and more content with living in Juneau it's also been really nice to get away as much as I have this summer. As anyone who has been to Juneau knows there really isn't anywhere to go once you are here so it's nice to hop on a plane and see some other places every now and then. Hope everyone has a great weekend. I'll try to post a race report Sunday or Monday.